My first introduction into the world of Dangerous9 straps was about a year ago when I picked up an amazing ocean blue stingray. I did a review on it and it was met with a ton of fan fare and I always got compliments on it wherever I went. To this day anytime I post the picture on Instagram everyone wonders where I had it made. I thought it was about time I picked up another strap from Dangerous9 because the quality and combination of materials is hard to beat. I spoke to John and he told me about a new matte alligator hide that is to die for. I told him I am down and he got started on working on my custom piece. I had no clue that when the strap arrived it would be this amazing. As with any strap that John creates he sends out some finished product pictures to just make you fill with even more anticipation. When I got the email that the strap was done and looked at the pictures I was left with my mouth wide open. It was so beautiful and everything I had asked for and more. Little did I know that when I opened the package I would be as giddy as a school child on christmas morning. There were a few choices of color and I decided to go with the Graphite blue color. It’s a really dark color that definitely looks black most of the time but in the right light you can see the faint blue-black color of this gorgeous strap. The hide has been treated in such a way that it is super smooth and matte. It is very much on par with the OEM JV strap that everyone is obsessed with in the Panerai community. The texture of the strap is really something to be felt in person. It’s hard to use words to describe such a smooth and silky strap. The alligator hide is precisely cut and placed so it gives a nice transition from the thicker scales down to the smaller ones at the tail end. To compliment the faint blue color of the strap, I decided to go with a turquoise linen stitching all the way around. There isn’t much you can say about the stitching, except that is expertly done. A quick look at it and you will notice how close to the edges the stitching is without missing a beat. I had a few extra options added on to the strap to give it a true unique look. This is one thing that I do enjoy about ordering from Dangerous9 Straps, they have ton of upgrades that can make your strap truly something you designed and made. Instead of getting the same cookie cutter strap style you get to have a hand in every little detail of your strap creation. First, I went with the same Super Exotica upgrade that I put on the stingray strap. This options lets you have a nice exotic skin lining on the underside instead of the boring old leather back. I chose an eel backing and did it in the same turquoise as the stitching to give it that extra flare. I then added padding in the lug area to resemble the OEM style straps that we are accustomed to. The padding on the Dangerous9 strap is a bit thicker than OEM but not overly thick by any means. Lastly, I opted for one of his new options that seemed very intriguing. The “Thick Curved Lug System”. This system he has created for his straps basically makes you mount the strap at a 90 degree angle to the lug and creates absolutely no gap where the strap meets the watch. When the strap is mounted it can not be bent back and directly conforms with the shape of your wrist. The best way to describe it would be that the strap is like the ones you would find on Hublots where the watch can not really lay flat and the strap is almost an extension of the actual lugs. It is a very interesting feature and I have grown to like it a lot with more wrist time. The buckle end is finished off with one of his polished Pre-V buckles and a 2 keepers system consisting of one fixed and one floating keeper. As with my other strap from Dangerous9 it is very comfortable out of the box. With this having the more rigid padding and lug system you will need to break it in a bit. By no means is it uncomfortable but just needs a little time to conform to the shape of your wrist. This strap is going to be part of my daily rotation because of the sheer beauty of it. 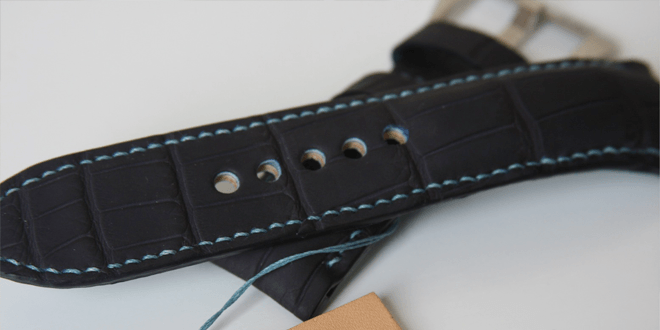 The contrasting blue stitch and blue backing on this strap will definitely turn some heads. I was curious to see how the curved lug system would work but I am pleased to say it definitely is a nice feature and gives the strap a solid feel around the wrist. If you don’t mind your watch not being able to lay flat then I would recommend getting at least one strap with this system. Having no gap at the lugs and the strap conforming to the wrist is a pretty nice upgrade. Hole is a bit small for the buckle on the first try, but does open up. Strap is on the pricer side of things but it is well worth it. Wait time can be long since there is a waiting list. All of Dangerous9 Straps are complete custom orders and take a bit of time to create since he is very high demand and everything is hand made. The version I got with the custom options pricing breakdown is below.